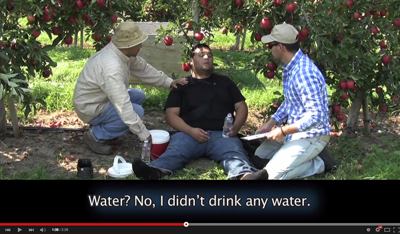 Heat illnesses are preventable but if left unchecked can lead to death. Anyone working in the sun will find this site’s information critical to learn for themselves and their coworkers. Heat Cramps. Athletes are familiar with this syndrome caused by salt depletion. It is easily treated with rest and drinking electrolyte-balanced fluids such as sports drinks or plain water and eat salty chips or nuts. Avoid salt tablets due to the risks of overdosing. Heat Syncope/Fainting. Fainting happens when blood pools in the legs, often after standing too long. It is temporary; being horizontal usually prompts a return to consciousness. The biggest risk is an injury from falling. To help blood return to the heart, elevate the person’s legs, and cool the body with wet compresses and fanning. Turn the unconscious person on his or her side to prevent choking. One exception is if the person has been working hard; then consider the fainting due to heat stroke and call 911. Check the ABCs (airway, breathing and circulation) and cool him or her down immediately. Anyone who faints should be medically evaluated and not return to work. Heat Exhaustion. This condition is serious and is caused by severe dehydration. Symptoms can include fatigue, dizziness, nausea and vomiting, plus early neurological signs such as headache, impaired judgment and anxiety. Exhaustion causes profuse sweating and cool, clammy skin. Move the person out of the heat, provide fluids as tolerated, strip off extra clothing, and cool them by wetting clothing and fanning. Have them medically evaluated. Heat Stroke. This is a medical emergency. It can look like exhaustion except the body temperature is 104 degrees F or higher, and the brain is seriously affected. Neurological effects can include confusion, irrational or aggressive behavior, incoherent speech, collapse, convulsion, and coma. When the body’s heat-coping mechanisms have failed, sweating stops and the skin becomes red, dry and hot to the touch. Call 911 and quickly lower the body temperature. 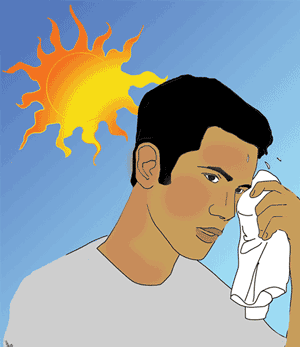 Learn to recognize heat-related illnesses. Identifying and responding to early symptoms can save lives. Encourage a buddy system for remote work locations. Use the heat index to calculate how hot it feels. 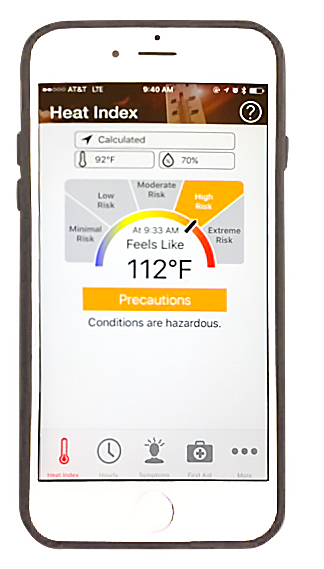 Download the OSHA-NIOSH Heat Safety Tool App. Hydration is the most important step to combating heat stress. 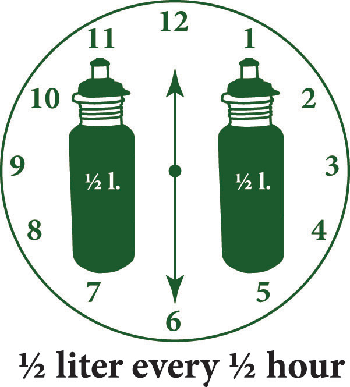 In extreme heat and humidity, workers should use the half-half rule: drink ½ liter every ½ hour. Workers should not wait until they feel thirsty to drink; if they are thirsty, they may already have lost 2% of their body’s water. The onset of heat exhaustion can begin after losing 3% of the body’s water and heat stroke occurs once 8% is lost. The bottom line is, if a worker is not regularly urinating or has dark urine, they are dehydrated and at risk for heat illnesses! Assess the relative danger of the CONDITIONS and your PERSONAL risk factors. Conditions: Be aware that high heat, high humidity, low air circulation all create a more dangerous working environment. When more than one of these variables is present, the danger is compounded. In these conditions, workers need to take breaks in the shade and wear light, breathable clothing and hats. Some farmworkers wear excess clothing to protect themselves from the sun, but this is a dangerous practice that has resulted in a local death. Take the Personal Risk-Factors Self-Assessment questionnaire listed under resources (below) to determine additional risk. If an employee is new to a job or is returning after time away: ease them back into full-time work over the course of 5 days. Starting workers at half-time or 50% effort and increasing to a full-time work load (by 10% each day) can greatly reduce the employee’s susceptibility to heat stress. Bilingual transcripts are also available. Heat-related Deaths Among Crop Workers - United States, 1992-2006, is a crop worker hazards collage published by the CDC in June 2008. It provides a case study of a crop worker's heat-related death and summarizes heat-related fatalities among crop production workers during a 15-year period.